Russia warns of "outside interference"
United Nations (CNN) -- Members of the U.N. Security Council proved unable to reach a unified stance Wednesday on how to respond to the widespread violence that has engulfed Syria in recent weeks and resulted in the deaths of hundreds of demonstrators. Frustrated representatives requested the public session to air their grievances against Syria after the council failed to agree on a joint statement condemning the violence. More than 300 demonstrators have been killed by security forces and their supporters since the unrest began in mid-March, said the United Nations' under-secretary-general for political affairs, Lynn Pascoe. Since then, the violence has spread to cities across the country, he noted in a televised meeting. "Despite the promise of reform, in fact, the government crackdown has intensified," he said. In some cities, food and water, medical care and services were in short supply, he said. From Friday to Sunday, more than 100 people have been killed, he said. Reliable sources have consistently cited the use of artillery fire against unarmed civilians, door-to-door arrest campaigns, shooting of medical personnel who have tried to help, raids of hospitals, clinics and mosques and destruction of medical supplies, he said. He added that there have been credible reports of "a very few instances" where protesters have used force resulting in the deaths of security forces. Ambassador to the United Nations Susan Rice said the United States "condemns in the strongest possible terms the abhorrent violence used by the government of Syria against its own people. My government calls on President (Bashar al-)Assad to change course now and heed the calls of his own people." She also called on the international community "to respond to this brutal crackdown and to hold accountable those who are perpetrating these gross human rights violations." The United States, she said, is "considering a range of options," including targeted sanctions against Syria for its actions. "These brutal acts are neither those of a responsible government nor a credible member of the international community," she said. "The Syrian people's cries for freedom of expression, association, peaceful assembly and the ability to freely choose their leaders must be heeded." But Russia's deputy U.N. ambassador Alexander Pankin told the 15-nation council that "a real threat could arise from outside interference" and could lead to "a never-ending cycle of violence; this is an invitation to civil war." The Syrian ambassador to the world body, Bashar Jaafari, asserted that Syrian law enforcement authorities "have exercised utmost restraint in order to avoid the killing of innocent civilians." He blamed "armed criminal elements" for the violence, and -- waving a piece of paper in the air -- said he had a list of 51 members of the armed forces who had been killed by "armed gangs." In addition, he promised, "there will be further measures by the government to bolster reform in the country." He accused the United States of having supported the opposition, and said Syrian authorities have stopped shipments of arms from entering the country, shipments that he said had been sent from overseas by "extremist" groups to their agents inside the country to kill innocent people "and cause chaos generally." Their goal, he said, is to overthrow the government. Syria's response, he added, "was natural." He then took aim at the meeting of the council. "We believe that some of the statements we heard today against Syria can only be considered an act of encouragement to extremism and terrorism. The price will be paid by innocents in Syria and the world." The country's leadership, he vowed, "will go forward on the road of reform. We will continue to satisfy the legitimate demands of our citizens. We will continue to protect their lives and property. We assert we shall not allow terrorism or extremism to kill our people." He rejected as "unfounded" the U.S. claims that Iran was helping Syria repress its citizens. "This surreal link, this Hollywoodian attempt to link the two does not express any respect for the Security Council and its responsibility to protect international peace and security." 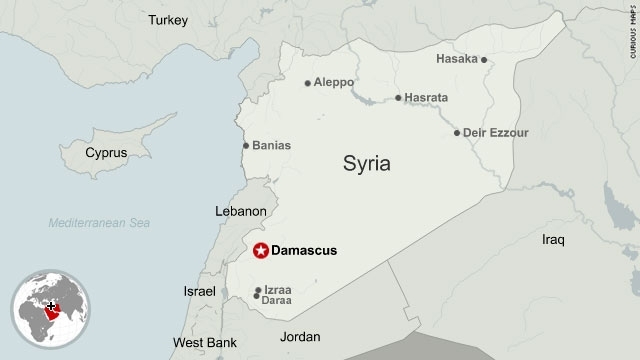 The remarks came as terror reigned Wednesday in the Syrian city of Daraa, where intermittent gunfire rang out overnight and snipers held their positions on rooftops, a witness said. The situation "is worsening day after day" where the country's uprising started, he said. Nine people were killed by sniper fire Wednesday, and five were killed Tuesday, said the witness, whom CNN is not identifying for security reasons. Funerals were not taking place because the cemetery was occupied by security forces, he said. The group Syrian Human Rights Information Link reported that at least 447 people have died since the uprising began last month. The group said the deaths include 17 people killed in Daraa earlier this week. While the vast majority of the people listed were apparently civilians, some of the dead are listed as members of the military or security forces. Mohsen, a witness in Daraa, said security forces have stormed homes and arrested people suspected of being protesters and sympathizers. There have been many mistaken identities, he said, adding that at least 12 people in his neighborhood of al-Kashef were arrested Wednesday. Dead bodies have remained in the streets for days because people -- fearing sniper fire -- have been afraid to pick them up and bury them, he said. There is a severe shortage of medicine and food, even bread, Mohsen said. Since Sunday, stores have been closed; electricity, water and all mobile and landline communications have been shut off, he said. Protests composed entirely of women took place in two neighborhoods Tuesday and Wednesday, Mohsen said. The demonstrators called on security forces to release their sons and husbands and stop the siege. Al-Assad's forces responded by shooting into the air to disperse them, the witness said. Witnesses in Daraa and Syrian human rights activists say there has been tension among different units of the security forces, with some army senior commanders refusing to open fire on protests. Some witnesses even described instances of armed confrontation between different elements of the security forces. CNN could not independently verify such reports. Mohsen described two such incidents. One took place Monday in the al-Mataar neighborhood in western Daraa, where residents witnessed what appeared to be an exchange of fire between two military units. The other happened on Tuesday in the al-Jisr neighborhood. Shortly after that incident, ambulances came and picked up bodies, witnesses said. In a video posted Wednesday on YouTube, a man who said he was in Banias states that the demonstrations were "to claim our rights, our justice, our freedom." Complaining that the government refers to the protesters as terrorists, he said, "it's a big lie." "We are all brothers, we are all friends, we are all neighbors," the man said of the Christians and members of different Muslim sects who live in Banias. In the video, hundreds of men can be seen walking by. "Why they get us? Why they fire at us when we make demonstration? Why they get people in Daraa? I ask why, and I want an answer." A group calling itself National Initiative for Change, which said it includes activists in Syria and elsewhere, vowed Wednesday that the "popular uprising" will eventually lead to the overthrow of al-Assad's regime. The group issued a statement saying it had 150 signatures, including "150 politicians, civil society activists and human rights defenders" inside Syria, whose names were not being published for safety reasons. But the Syrian government, which has described protesters as "armed criminal groups" and "terrorists," said Wednesday that a member of an "extreme terrorist cell" confessed to "receiving money and arms to kill security forces and civilians." State-run news agency SANA carried quotes from the man, named as Mustafa bin Yousef Khalifa Aiyash, saying that even 5-year-old children were armed in the effort. The U.S. State Department Human Rights Report on Syria, published earlier this month, says that in 2010, "Courts systematically used 'confessions' extracted under duress as evidence, and defendants' claims of torture were almost never investigated." The Syrian government has argued that citizens want security forces to arrest members of these groups, and that numerous weapons have been confiscated in the arrests. Several "martyrs" have been killed by these groups, the government said. "The Syrian TV reported that an extremist terrorist group was arrested in the coastal city of Jableh, which opened fire on citizens and destroyed public and private properties," SANA reported Wednesday. Razan Zaytouni, a human rights activist in Damascus, said "innocent people are killed now, including children and women." Rejecting the government's depiction of protesters, she said, "The only terrorists are those who are killing our people there now." The Syrian protests -- part of a wave of uprisings in the Arab world -- began in Daraa last month following a crackdown by security forces on peaceful demonstrators protesting the arrests of youths who scribbled anti-government graffiti. Protesters have asked for freedom and regime reform, and public discontent with al-Assad's government has mounted. Activists also want the easing of the ruling Baath Party's power and a law that would permit the establishment of independent political parties. CNN has not been granted access to Syria and cannot verify death tolls and witness accounts. CNN is not the only news organization having difficulty getting information from Syria. Citing restrictions and attacks on its staff, Al Jazeera suspended its operations inside Syria indefinitely, the Qatar-based news network told the Committee to Protect Journalists Wednesday. At least five Reuters and two Associated Press journalists have been forced to leave the country in the past six weeks, said CPJ, a New York-based, independent, nonprofit organization. "Syria believes that by harassing, expelling and arresting journalists it can prevent the world from seeing the civil unrest gripping the country," said CPJ Middle East and North Africa Program Coordinator Mohamed Abdel Dayem. "This strategy has already failed in Egypt, Tunisia and Yemen. The government in Damascus must immediately stop harassing and threatening all journalists and allow them to work freely." CNN's Nada Husseini, Richard Roth, Anderson Cooper, Amir Ahmed, Arwa Damon, Rima Maktabi, Elise Labott, Amir Ahmed and Raja Razek contributed to this report.